Twist, lick and dunk! 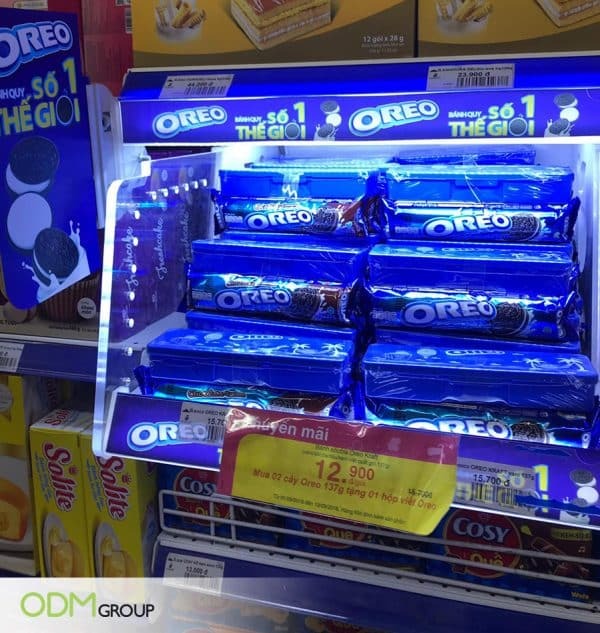 – Oreo Vietnam is back again to offer more treats – with a free additional roll of Oreo when a pack is purchased. By placing a LED POP display, it will certainly do the trick to declare its presence in sea of crowd. With bright lights, the classic blue packaging is sure to outshine it’s competitors! This will surely lead to more impulse purhase. How Will A LED POP Display Benefit Your Brand? Visibility – An aesthetically appealing display will attract more customers to products, hence increase the likelihood of purchasing as compared to a dull display. So it is important to design a display that is able able to grab hold of customer’s attention. This video advertising display certainly garner attention! If it is not customer friendly, the chances of sales will drop. Brand Awareness & Recognition – Having an eye catching display will certainly boost brand awareness as customers are more inclined to learn more about the brand. Positive remarks will spread across the community and the brand will enjoy a rise in sales. This strategic marketing tactic will see an influx of new customers as the brand will be associated with good advertising. Brand Loyalty – This will certainly create a broader customer case as brand continues to innovate. Therefore, the brand has a competitive advantage as there will certainly be returning customers! Now, we understand why it is a necessity to ensure the visuals of an in-store display – it can either make or break your brand! At ODM, we have a dedicated team of designers and manufactures that can produce marketing gifts, custom POP displays, and high quality products to your expectations. Feel free to send us an inquiry! Check out Oreo’s eye-catching packaging! Learn why it stood out on the shelf. This giant in-door display from Adidas gained the brand massive attention. How did Gillette got their customers talking about their products? Read on the blog to know how! We certainly love this POS display by Smirnoff. The bold color broke the monotony of the display.